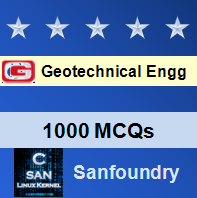 This set of Geotechnical Engineering Multiple Choice Questions & Answers (MCQs) focuses on “Constant and Falling Head Permeability Test”. Explanation: Falling head test is used for relatively less permeable soils where the discharge is small. 2. Which of the following formula is used in Falling head permeability test? q = K i A. Explanation: The head h1 and h2 at any time instant t is equal to the difference in the water level in the stand pipe and the bottom tank. Explanation: In a constant head test, the length of the sample is measured by inserting piezometric tubes on top and bottom. Explanation: Coarse-grained soil, for which a reasonable discharge can be collected in a given time, is used in constant test. Explanation: The laboratory measurement of falling head permeability test consists of measurement of the heads h1 and h2 at two chosen time intervals t1 and t2. 7. Which of the following tubes are used in the constant head test? Explanation: The constant head test apparatus consists of three tubes: the inlet tube, the overflow tube and outlet tube. Explanation: -dh is used to denote a change in a smaller time interval dt, the minus sign has been used since h decreases as t increases.